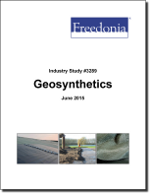 US demand for geosynthetics is forecast to rise 3.8 percent yearly to 1.3 billion square yards in 2019, valued at $2.5 billion. Nonwoven geotextiles will remain the dominant product by volume, while geomembranes will grow the fastest from a smaller base. The best market prospects will be in construction and transportation infrastructure. This study analyzes the one billion square yard US geosynthetics industry. It presents historical demand data (2004, 2009 and 2014) and forecasts (2019 and 2024) by product (e.g., geotextiles, geomembranes, geogrids), market (e.g., construction, transportation infrastructure, landfills, liquid containment) and US region. The study also considers market environment factors, details industry structure, evaluates company market share, and profiles 36 industry players, including GSE Holding, Tensar, and Propex.